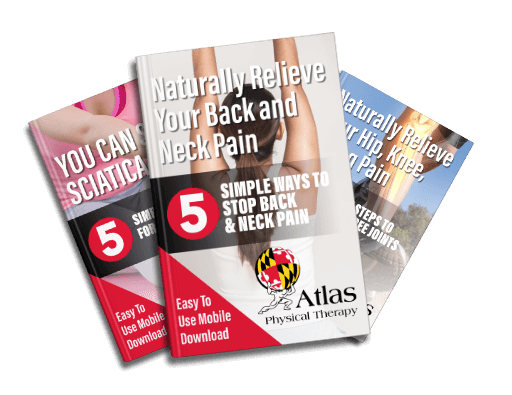 Atlas Physical Therapy is a family owned and operated physical therapy practice located in Glen Burnie, Maryland. Our physical therapists treat all ages from elementary school to 100+ years old. If you’re in pain, and want to avoid pain medications, injections, and surgery we can help. We accept all major insurances and can help even if you don’t have insurance. I came to Atlas for the free Seminar to learn if I could manage or eliminate my pain and stiffness. I had trouble sitting/driving and had difficulty moving after returning home from my job. The staff did wonders to return my flexibility – and greatly decreased the amount of discomfort and pain I was experiencing daily. Download one of our free E-book Reports instantly for common problems such as Back & Neck Pain, Sciatica, Hip & Knee Pain, Pain associated with pregnancy, and more! You have more options than ever for the day to day aches and pains. When combined with monitored physical therapy, you can use all of the following tips to relieve the symptoms of arthritis while improving the strength and the mobility of your muscles. At Atlas Physical Therapy, our physical therapists offer a variety of monthly workshops to help you better understand your body, and what you can do to live a healthier life. Common Workshops at Atlas Physical Therapy include Back Pain & Sciatica, Knee Pain, Neck Pain, and much more!